This all happened when my wife was at her mother’s (that is my mother-in law house) and I was left at home with my sone (13 years) and my 69 year old father – who lives with us. I had to stay at work late one night. Normally I would call my wife and let her know, but she was at her mother’s house so there was no point. My father doesn’t have a mobile phone and I didn’t think it was important to call him. Normally, I would get home around 6pm, but that night I didn’t get home until after 11:30pm. When I got home, both my father and my son were up waiting for me. Clearly they had been very worried. They were very happy to see me at first, but then my father asked why I was home so late. I told him about having to work late. He asked why I hadn’t called. I told him that I didn’t think it was important to call him. I was a grown man, not some kid that had to check in with his daddy. Dad got mad and we got into a big argument about it. I went to bed without dinner. After two days later, it was Saturday and I only had to work a half day. My son also only had a half day at school on Saturday. When I got home my he wasn’t home. I waited, but still no kid. I started calling around to try to find him. No one had seen him. I got increasingly worried and so depressed that felt like crying. Finally he got home, 3 hours later than usual at around 4 pm. He dropped off by his friend’s dad who told me that they had a birthday celebration at their house. The minute the other father was gone all my fear boiled over and I slapped my son. I asked him why he hadn’t called me to tell me where he was. I yelled at him for being so inconsiderate and for worrying me. To my chagrin, he replied me that he was a grown up child and didn’t feel that it was necessary for him to tell me of his every more. He reminded me of the situation a few days before and how I hadn’t felt it was important to inform my own father that I would be late. My father was standing near listening to all of this. 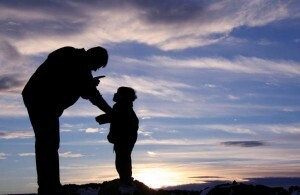 All of a sudden, I felt so ashamed and sorry for what I had done to my own father. I realized it doesn’t matter how old we grow we are still our parents children and they will worry about us until our last breath. That day my son taught me a good lesson!! !